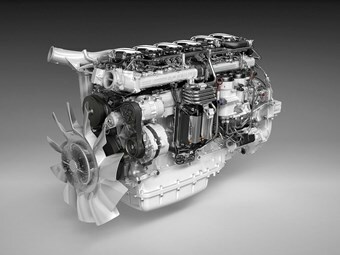 Scania adds a 450hp, 13-litre engine to its Euro 6 range of engines. Scania Australia will soon offer a 450hp Euro 6 engine that forgoes exhaust gas recirculation (EGR) technology and just uses selective catalytic reduction (SCR) to meet emission standards. "Our success with the (European market) 410hp version of the 13-litre engine with SCR-only has spurred us to go further down the road to reduce both complexity and diesel consumption," Scania head of product management Joel Granath says. Scania’s new engine, the DC13147, is provided as an alternative to a similarly specced Euro 6 engine that uses both SCR and EGR. The SCR-only version is said to offer improved fuel efficiency over the SCR and EGR model, with the trade-off being that it will consume more AdBlue. "According to our own calculations running a Scania Streamline, this results in a 1 percent fuel saving compared with the previous model using both EGR and SCR – everything else being equal," Granath adds. According to Scania the SCR-only version uses roughly twice the amount of AdBlue in comparison to the model with both SCR and EGR, up to an average of 6 percent of diesel. "Just as with the extremely frugal 410hp model that appeared last (European) autumn, this engine is ideal, especially for line-haul customers who prioritise low fuel consumption, but don’t want to give up on torque or driver comfort," Granath adds. The new engine will be available in Australia soon, though Scania is offering the 450hp engine fitted with both EGR and SCR right now.